Queensland house furnishing was the product of necessity, fashion and sentiment. They reflected the lifestyles and aspirations of their occupants and evolved over time. Most effort was put into furnishing rooms that might be seen by visitors. These followed Sydney fashions even though the trends generally arrived in Queensland later. So, for example, wallpaper grew in popularity the 1890s, at the time it was going out of vogue elsewhere. 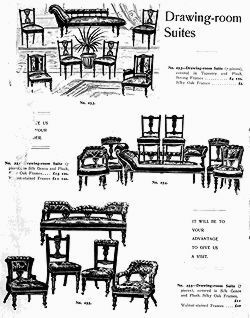 Queensland furniture from the 1820s was largely Classical in design. Useful rather than ornamental furniture was the first requirement. The timber most commonly used was local cedar from subtropical rainforests which looked like fashionable mahogany and was light and easy to work. By the 1860s, greater prosperity led to more elaborate furnishings. Red cedar was the most popular timber but other local woods, such as hoop pine, bunya pine, yellow wood and rose mahogany were also used. The Rococo revival of Queen Victoria's reign saw the introduction of curved shapes and florid carving. Local cabinet-makers often simply superimposed the Rococo curves on the sturdy old Classical designs. German and Chinese cabinet-makers entered the market during the second half of the nineteenth century. Between the 1880s and the end of the nineteenth century, tastes shifted again. The opening of Japan to American trade brought a fascination with straight and angular designs, while the Arts and Crafts Movement renewed interest in Queen Anne and George I. The curved shapes of the previous years were largely rejected. Local firms, like F. Tritton, John Hicks and Finney Isles, issued their own catalogues for the first time. Notable local cabinet-makers included John Mason of Maryborough, as well as Lewis J. Harvey and Ed Rosenstengel of Brisbane. The furnishings of the main rooms of Queenslander houses changed with the transition from the Colonial/Victorian era to Federation. Red cedar disappeared from fashion – just in time to save it from extinction – to be replaced by silky oak, Queensland maple, white cedar and stained pine. The timbers were often fumed with ammonia to enrich their colour to a warm brown. The new fully-upholstered lounging armchair made its appearance. In the bedroom, the dressing table was a chest of drawers with a mirror attached, and a box ottoman replaced the old trunk for clothes storage. There was a real acknowledgment of our climate in the design and use of furniture. Cane, willow, bamboo and linen grass furniture entered the scene.